As an orthopedic physical therapist, there are few injuries we treat that are as debilitating as plantar fasciitis. This sharp, stabbing pain in the bottom of the foot happens with every step the person takes. As one who has experienced it before I can tell you three things for sure about plantar fasciitis: 1) it’s difficult to treat, 2) it takes time, patience, and consistency to treat, and finally 3) there is hope and it can be cured! Today on the Fit Stop Blog our foot and ankle specialist, Toby Bluth, PT, DPT, is discussing this miserable issue… what it is, why you get it, and some home exercises you can do to help it feel better! 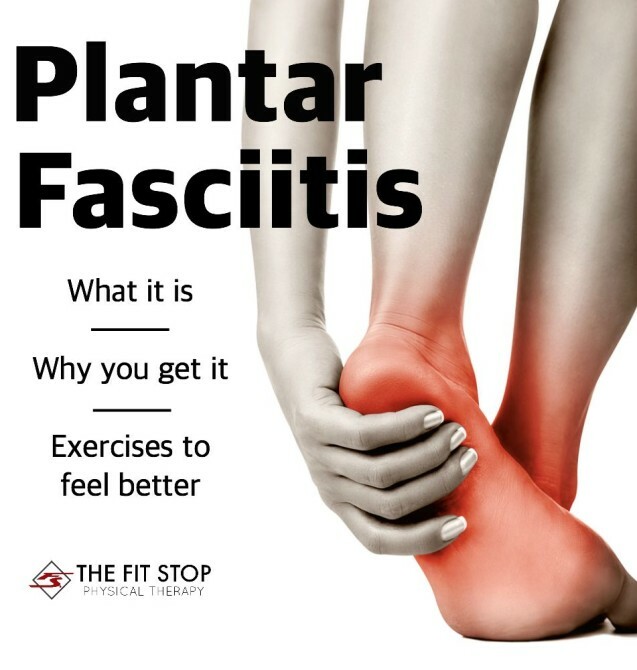 Keep reading for more…What is plantar fasciitis (PF)? As usual, we get a clue as to what this is by looking at the name and the anatomy. First, with an “itis”, we know we are dealing with a pain associated with inflammation. 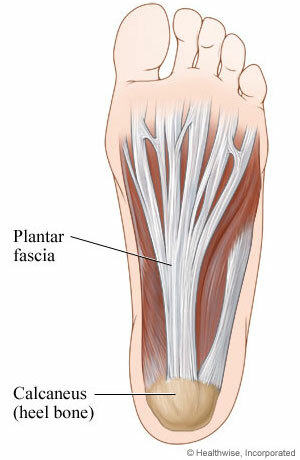 So in this case, we are dealing with inflammation of the plantar fascia. The plantar fascia is a strong ligament that attaches to the heel bone (calcaneus) and runs out and inserts in a fan like shape into the underside of the first row of toe bones (metatarsal heads). This is obviously an important part of our foot as it helps support the arch in our foot when we are walking or running. It has to withstand an enormous amount of stress to assist us as we push off during walking and running activities. FOR THE TREATMENT OF PLANTAR FASCIITIS! If you have any questions or concerns about your foot pain or wonder if you have PF, don’t hesitate to stop by any of our clinics any time. Walk-ins are welcome any time for a quick consult, and don’t forget about our FREE Bumps and Bruises Clinic Saturdays from 10:30 to noon at the Heber Clinic. I have struggled with plantar fasciitis for the past few months and it is really difficult to deal with. Like the article says, the first steps in the morning are the worst. I have tried a lot of different things to help with the pain but it just makes walking anywhere really difficult. My husband and I used to be marathon runners and I can’t run at all anymore. I will have to put these exercises to the test and see how well they work for me. Thanks for sharing. Speaking from experience (personal and professional) plantar fasciitis can be extremely difficult to treat. I hope you find something in this post that gets you headed the right direction towards recovery. If there’s anything we can do for you please let me know! Thanks for commenting. This is a thorough yet easy to understand post on what plantar fasciitis is along with its potential causes. It is very important to understand how plantar fasciitis can occur and what can be done to treat it.